In north India, it is possible to meet yogis from an ancient lineage who are called kanphata yogis, wandering sadhus with pierced ears who are followers of a tantric adept known as Guru Goraksha Natha. In western India and Pakistan, these sadhus are called gorakhnathis, in honor of their teacher. In Tibet and the Himalayan kingdoms, they are called siddhas. But whichever name they claim, the sadhus of the Natha tradition are the custodians of the most authentic, traditional, and least watered-down practices of yoga. What is so unique about these yogis? They have unwavering faith in the traditional wisdom that proclaims, “By mastering one, you master all.” They choose one asana and practice until they have mastered it, arranging the rest of their disciplines simply to support this goal. 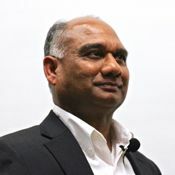 One of their favorite asanas is bhadrasana, which they prefer to call gorakshasana. Why? Because according to legend, it was discovered by the founder of their tradition—Goraksha Natha (Gorakh Nath in regional Indian languages). What is so special about gorakshasana? What can you gain by practicing it? How can gorakshasana make you healthier, happier, stronger, and more vibrant? What effect does this practice have on your health? What effect does this practice have on your mind? How does it awaken kundalini shakti? And does a sitting posture like this one have anything to do with your spiritual unfoldment? Gorakshasana is special because it slows down and eventually reverses the process of aging. This is a big claim; yet ancient scriptures and yogis grounded in traditional practices do not hesitate to support it. Let us look at how gorakshasana can accelerate the process of healing and rejuvenation, make us free from disease and old age, and ultimately help us live a vibrant life. According to the yogis, the body is like a well-furnished house, and old age is like a thief. Thieves are notorious for hiding in dark and unkempt places. They break into the house through the back door, or a rarely used window. So is the case with this ancient thief, old age. It enters the body through our back door, the muladhara chakra, the chakra at the perineum. It may also use one of the two lower openings—the urogenital or the excretory organs, which we normally treat with great carelessness. Great darkness, heaviness, sloth, inertia, and negligence often surround this area. As a result, old age, disease, and finally death take advantage of the conditions that have taken hold of this region. The greater this stiffness, the less the flow of pranic energy through the brain and spine; and the more stagnant the pranic energy, the faster we age. The first sign and symptom that the thief has entered our body is stiffness in the sacrum and lower back. The more stiff and congested our lower back and sacrum are, the more stiff and congested the base of our brain and the upper neck become. The greater this stiffness, the less the flow of pranic energy through the brain and spine; and the more stagnant the pranic energy, the faster we age. That is when we notice that our lower spine is compressed or locked up and stuck. Energetically, we feel sluggish and tired, and emotionally we feel burdened with fear, anxiety, and hopelessness. By practicing gorakshasana, we can restore the body’s inherent vitality, overcome sloth and inertia, and renew both our body and mind. Through the practice of gorakshasana, we can gain access to the base of our spine. From there, we can stretch the spine up and gain access to the space inside our shoulders and neck. Then, with the power of pranayama, we can ignite the fire of kundalini (spiritual energy) and energize the entire inner space of the body from the perineum all the way to the crown of the head. Thus, by practicing gorakshasana, we can restore the body’s inherent vitality, overcome sloth and inertia, and renew both our body and mind. Eventually, an advanced practice of gorakshasana will free the mind from negative thoughts and base emotions, enabling it to discover the psychic and spiritual energy that often lies dormant deep within. Because gorakshasana is an advanced sitting posture, you need a strong lower back and flexible hips, thighs, knees, and ankles in order to practice it safely. This asana also requires an extraordinary level of mobility in the sacrum and the hip joints. Warm up with simple stretches to strengthen your lower back, knees, and ankles, and enhance the flexibility of your hip joints. The butterfly pose (baddha konasana) is one of those preparatory stretches, and the beginning position for gorakshasana. Sit with the soles of the feet together near the pelvis. To open the hip joints and stretch the inner thighs, press the knees down. Take time to refine and master the butterfly pose, gaining enough flexibility so that the length of the thighs and lower legs can rest comfortably on the floor. Eventually you will be able to bring your feet closer to the pelvis. Make sure your heels and toes are pressed flat together. 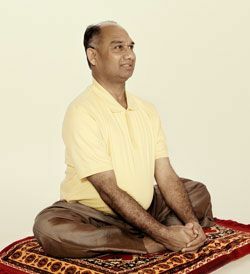 Then place your hands on the floor near the back of the pelvis, and lift the pelvis, keeping the feet on the floor (Fig. 2). Swing your body back and forth, finally shifting your pelvis forward over your feet while your feet and knees stay in place on the floor. At the culmination of this pose, your perineum is resting on your ankles. At this stage, your whole body is resting on your feet and outer calf muscles, while the perineum is fully placed on the heels. Once you are comfortably seated, bring your hands onto your thighs, fingers facing outward, and stretch your spinal column upward by pressing your hands into your thighs. Straighten your arms, lock your elbows, and push your shoulders up to your ears, stretching the shoulder blades and the whole shoulder girdle up and forward. If it’s not too uncomfortable to maintain this pose, unlock your elbows, pull your shoulders backward, and rotate the entire shoulder girdle, alternately lifting the shoulder blades up and forward, and drawing them back and down. This posture allows you to work deep inside your shoulders, neck, and collarbones. Once the pressure in your hip joints, knees, and ankles is no longer enjoyable, gently release gorakshasana and come into a comfortable sitting pose. Stretch your legs and massage any area where you may be experiencing slight discomfort. Tantric adepts use the bandhas (the locks), breath retention, and mantra repetition to take gorakshasana to the final stage. 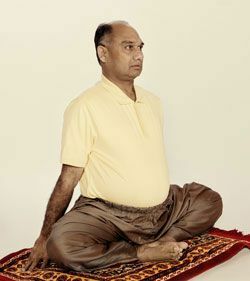 This level of practice is possible only when you can sit comfortably on your heels with your feet placed so deeply under the pelvis that you are able to sit with your back straight. In addition, you must have mastered the bandhas, pranayama, and breath retention. To work with this version, place your palms on your thighs closer to your knees, stretch your whole torso upward, and lock your elbows. Then exhale fully and apply all three bandhas simultaneously: mula bandha (the root lock), uddiyana bandha (the navel lock), and jalandhara bandha (the throat lock). Retain your breath, close your eyes, bring your mind to your navel center, and visualize the fire at your solar plexus. If you have practiced breath retention regularly and can retain your breath for more than 30 seconds, then while you are visualizing fire at the navel center, mentally listen to the sound of ram, ram, ram—the bija mantra of the sacred fire. Gorakshasana is one of the most outstanding among all yoga postures that allow your mind and breath to enter the space inside the sacred bones of the sacrum. For this reason, yogis call it bhadrasana—the sacred or auspicious pose. In advanced tantric practices, adepts require that aspirants practice this pose before they undertake the more esoteric practices of tantra. Gorakshasana is the gateway to the space hidden deep in the pelvis, where the muladhara chakra lies, according to tantra and kundalini yoga. This chakra, if healthy and balanced, brings stability to both the body and mind. If disturbed, the muladhara chakra is also the source of a variety of mental upheavals such as fear, anxiety, doubt, and insecurity. That is why the tantric adept and the founder of the Natha tradition, Goraksha Natha, practiced this asana so religiously, thus giving later adepts justification to name this asana in his honor.